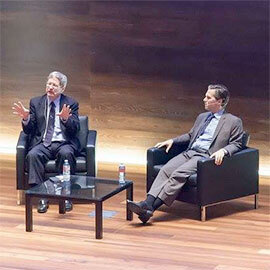 On Tuesday, Nov. 10, 2015, the Lazaridis School of Business and Economics hosted its annual Economist-in-Residence discussion with Jeffry Frieden, a professor of government at Harvard University and the author of Currency Politics. Frieden presented on the topic of "The Future of International Finance" and focused the discussion on China and the Eurozone. Frieden argued that the Chinese government needs to focus on changing its economic growth model and stimulate domestic demand for domestic services and goods. He then discussed the current situation in the Eurozone and described it as the current “problem-child” for the global economy. Later in the evening, the Laurier Centre for Economic Research and Policy Analysis (LCERPA) presented its Economic Outlook 2016 at the Centre for International Governance Innovation. The theme for this annual event was "Global Markets: Local Realities." The event brought together Frieden, Derek Burleton, vice-president and deputy chief economist, TD Bank Financial Group, and Scott Peterson, business correspondent, CBC News. The evening began with an opening keynote from Burleton, who discussed the short-term outlook for the Canadian economy with a focus on the Kitchener-Waterloo region. He raised concerns about the rising levels of household debt as well as the current overvaluation in the Canadian housing market. His concerns stem from the effects of the likely U.S. interest-rate hike that is expected to occur in December on the news that the headline jobless rate dropped to 5%. Frieden then provided a short keynote of his own, focusing on the outlook for the global economy. He defined the current situation as “precarious,” saying that the situation is not dire, but neither promising. After Frieden's keynote, Burleton and Frieden participated in a question-and-answer session, with Peterson serving as the moderator. Burleton and Frieden fielded questions from Peterson, as well as questions from the audience. Thank you to all those who sponsored these events and to those who attended. Photos can be found on the Lazaridis School of Business and Economics Facebook page, under the Economist-in-Residence and Economic Outlook photo albums.